For 24 Hour Testing Call 844.825.5030 Today! Stay informed with up-to-date information. We typically book same appointments for drug and alcohol testing, audio testing and mask fit testing. For health assessments we are typically able to book within 1-2 days. If you have a large group of employees you need to test, please call and discuss. For post-incident/emergency testing, a technician is always available same-day. Do I need an account with you to book appointments? No, though we do require payment information at the time of booking as well as relevant company details and reporting details. Cash, Credit/ Debit. Applications are accepted for companies interested in setting up an account. Can you complete testing at our office/onsite? If you have a private washroom we can have access to for the duration of testing and a private area to complete paperwork with employees then yes! We are also able to complete health assessments, mask fit testing, audio testing and pulmonary function testing at your worksite if you can supply the work space for us. Call to inquire about these opportunities to make testing faster and easier for you! How soon can I get results? Express drug testing and breath alcohol results are delivered same day and you will leave our office with a copy of results. Lab testing results take 2-3 business days. Audio, Mask Fit and PFT results are delivered same day, if results are normal. Health assessment results are delivered next business day, unless further assessment is required. Do you issue Clean Cards? Yes! We understand that you need to get OnSite fast so we ensure you will leave our office with a Clean Card in hand (for Express drug testing and breath alcohol testing) providing your result is negative of course! What is the difference between 5, 7, 8 and 12 Panel drug tests? What type of drug testing can you do? We complete urine, hair and oral fluid drug testing. Depending on the situation and reason for testing, each method of testing has its benefits. Urine lab – gold standard of drug testing. Most accurate/ reliable and legally defensible. Hair – historic drug use. 30-90 days in the past. It takes approximately 5-10 days from the time of drug use for the hair containing drug to grow above the scalp where it can be collected. How do you test for adulterating a sample? Adulterants can be detected at the time of collection and during the laboratory analysis. Collectors are trained and certified to follow Department of Transportation guidelines and protocols enabling them to effectively identify samples that are tampered with, including evaluating temperature, unusual colour or odour, foreign substances, or tampering and substitution. Can I get testing done afterhours? My employee failed a drug/ Alcohol test… now what? Your company Drug and Alcohol Policy will answer this question for you. Typically, remove the employee from safety-sensitive duties and have the employee complete an assessment with a Substance Abuse Professional (SAP). If you need help navigating these situations, we are happy to assist. A Medical Review Officer is a licensed physician and who is responsible for receiving and reviewing laboratory results generated by an employer’s drug testing program and evaluating medical explanations for certain drug test results. What is a Breath Alcohol “Fail”? Your company drug and alcohol policy will outline this. Many factors play into this, including the amount consumed, the method of drug use, whether use is chronic or occasional, individual rates of metabolism and excretion, diet, the acidity of the urine, and the concentration of the urine at the time the specimen is collected. Because of these variables, the values presented below should be used as general guidelines only. Do not eat, drink or put anything in your mouth for at least 15 minutes prior to a breath/ oral fluid test. This includes water, cigarette, gum etc. How long is a Clean Card valid for? It depends on the company you are working for. Every company has a different drug and alcohol policy so only they can answer this question. What if I am currently taking a prescribed medication? Can this affect my drug test results? Some medications can cause a “false positive” on a drug test. In this situation, your sample would be sent to the lab for confirmation testing. The sample would be reviewed by Medical Review Officer (MRO) who is a licensed physician and who is responsible for receiving and reviewing laboratory results and evaluating medical explanations for certain drug test results. You may be asked by the MRO to provide a copy of your prescribed medications as part of the evaluation. Only the MRO has authority to overturn a “false positive”. If I inhale second-hand marijuana smoke, will I fail a drug test? The cut-off levels of our drug tests (as set out by the DOT and Canadian Model) are such that second-hand smoke will not cause a person to test positive for marijuana. Why do I have to empty my pockets before going into the secure washroom? Before entering the washroom to provide a urine sample, all outer clothing (including hats) must be removed, pockets emptied and valuables placed in a locked box to ensure the integrity of the sample provided. Department of Transportation guidelines indicate this procedure must be followed for all urine specimen collections and we adhere to DOT guidelines. Why can’t I flush the toilet or wash my hands in the secure washroom? Department of Transportation guidelines state all washrooms used for urine specimen collection must be “secure”. This includes turning off all water supply, blue dye in the toilet bowl, various other integrity ensuring procedures and donors are not allowed to flush the toilet to ensure the integrity of the urine sample provided. Recreational Cannabis will be legal on October 17th. Equip your staff to be ready for the changes! The topic of cannabis access and its use is sensitive and complex and carries great implications for health and safety. The legalization date of recreational cannabis is fast approaching and supervisors need to be equipped to respond appropriately to workplace cannabis concerns. Our presenters have been working in the Occupational Health Industry for a combined total of over 16 years, ensuring you will leave the training with valuable tools to put to use right away. All attendees who successfully complete the course will be given a Certificate of Completion. 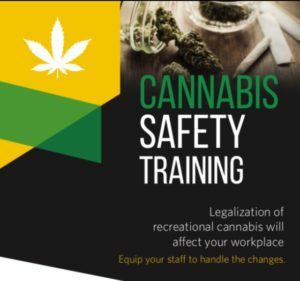 BONUS: Cannabis Safety Posters are given to attendees to post around your workplace to educate your workforce on cannabis must knows!! Classroom size is limited so CALL our office to book your Cannabis Safety Training TODAY!